Good morning my dear librarians! 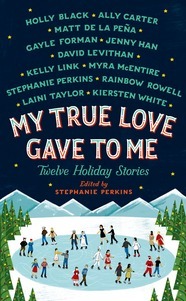 Love is in the air thanks to Stephanie Perkins’ collection of short romantic holiday-themed stories with contributions from her YA pals David Levithan, and Rainbow Rowell among others. Get the full e-galley on Edelweiss! Don’t see the green button? Then get whitelisted! And don’t forget to check out the adorable animated jacket! MY TRUE LOVE GAVE TO ME will be published by St. Martin’s Griffin on October 14, 2014.